This Saturday only rain or shine Helga is hosting a Yard sale. Come down to Wren Street in Mission (just off Lougheed). 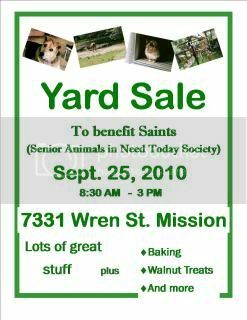 Buying and eating goodies never felt so good–all proceeds to benefits SAINTS. I will be there and I might even bring a certain long and low someone and/or a bouncy screechy someone (can you guess who?). If Helga can raise over $1,000 for SAINTS I will treat her and Carol to a lunch or dinner of their choice. So come help them get a free meal on ME! If she makes $2,000 I will throw in dessert too. And my mom loves dessert. Stationery and craft stuff – paper &envelopes, cards, scrapbooking stickers, labels, needlepoint kits, ready-to-paint plaster nativity set etc. Kitchen stuff – stainless steel bowls, Corningware French White casserole, 2 Insert slow cooker (new), bunch of as seen on TV kitchen gadgets, coffee mugs, cannisters etc. Lots of hair dryers, crimpers and straighteners , hair clips, nail polish etc. ** Plus local walnuts both plain roasted and praline style and a bit of home baking. Yummy snack while you shop! 2 Comments on "Yard Sale (+ dinner and dessert?)" Well, lunch would be lovely but with my low low prices I don’t think its going to happen. Sorry, Carol. Its a goal … not an expectation. You never know. Perhaps someone who really wants carol to have a real meal will buy all of your roasted walnuts! Yummy. (pst, whisper in your ear: regardless I will still take you two out. But don’t tell anyone because I want them to be generous with their loonies).